This tea set was completely hand built, including the Japanese style tea pot. Although not a potter, I find these pinch forms a pleasure to make. It would have been definitely faster doing it on the wheel, however I find the wheel imparts a very mechanical, sterile feel to a piece. 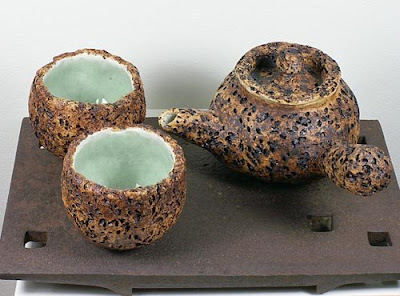 The texture on the cups and teapot was obtained by mixing in left over cooked brown rice in the clay and then forming the pinch forms. The rice burns away during the bisque firing leaving the voids. To make it "functional" (it's usable, but I regard it as a sculptural piece), the inside of the vessels were coated with regular paperclay and then a thin layer of Southern Ice porcelain paperclay was applied over the paperclay. The porcelain paperclay was added to provide a white background for the celadon glaze to "pop". An iron oxide wash was applied to the outside of the set. The piece is high fired to Cone 10. The presentation tray is actually a scrap piece of iron railroad tie plate that I found near the railroad tracks in my area. I thought it would make a most unusual complement to the piece. Heavy as heck, though!